It wasn’t pretty. It came against the worst team in the NFL. We knew that going in, and now we have visual proof. But not every win in the NFL is going to be a 35-3 blowout. Actually, very few of them are. So the Bills did what they needed to do. They played just well enough to prevent a bad from pulling off an upset. I know we all tend to over-react to the first game of the season, good or bad. That’s just the way it works in the NFL, when we’ve been waiting nine months to figure out our teams. I won’t do that. Yes, it was a win. 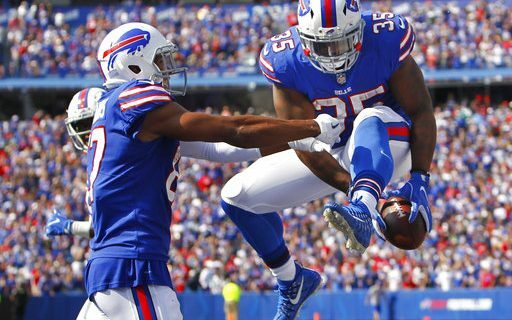 But it wasn’t enough of a win to make me feel like the Bills are any more than the 5-7 win team I thought they were at 12:59pm today. LeShon McCoy is the best player on this team, and one of the best in the NFL. He will take the Bills wherever they go this season. Shady was great, with 110 yards rushing and 49 yards receiving. He was versatile and explosive. It won’t be the first time this season when McCoy is the best player on the team. I think he’ll be the reason why the Bills win every one of those 5-7 wins. Tyrod Taylor looked just like he always has. No better, no worse. He’s the same guy he’s been the last two years. There were good throws, bad throws, inaccurate throws, improvised runs and good decisions. Anyone expecting a different #5 under a new offense, is likely going to be disappointed. Bills offense looks a lot like it should Emphasize the run, get the ball to McCoy in all ways possible. This is not a wide open attack. Taylor only completed four passes to wide receivers. OC Rick Dennison doesn’t have the personnel to go all-out. So he won’t. He will go all-out on McCoy. Charles Clay was clearly targeted within the play calling. That’s a good thing. He is probably the Bills best pass-catcher. He and McCoy should see the majority of targets and cathes, as they did today. Clay may finally be in a Bills offense that appreciates his talents. Jordan Poyer was the star of the game. He was active, around the ball, and a sure tackler. You know, everything the Bills haven’t had at safety. Ramon Humber ended all of those questions about who he was and why he was starting. This McDermott/Frazier defense highlights linebackers and let’s them make plays. Humber was that guy today. Turnovers should be a steady part of this defense. The zone-first coverage attack will lead to more takeaways because the defensive backs are always looking at the QB. Good start with the two interceptions. These are all good signs, but remember, a lot of teams are going to look good against the Jets. But enjoy it Bills fans, Your team is all along in first place in the AFC East.